One year to the day of her birth, a sighting of RA20 was reported to the Kauai HMS Hui hotline. In 2011, she was reported on the east side and south shore on several occasions. Then, she all but disappeared from Kauai. Over the years, periodic sightings placed her on Maui and Hawaii Island. In 2017, word traveled down the Hawaiian Island chain that RA20 had given birth on Hawaii Island. Unfortunately, three days later, the pup was found dead and floating in a tide pool. A necropsy was performed and a histopathology report supported drowning as the ultimate cause of death. However, other tests showed some abnormalities that may have led to a weakness in the pup and predisposed it to death from drowning and/or trauma. Even with milk found in the stomach, there was evidence of poor nutrition (declining blubber cells, fatty liver) as well as a possible infection in the liver (necrotic cells) and belly button, all consistent in a poorly thriving pup. But that brings us to 2018. 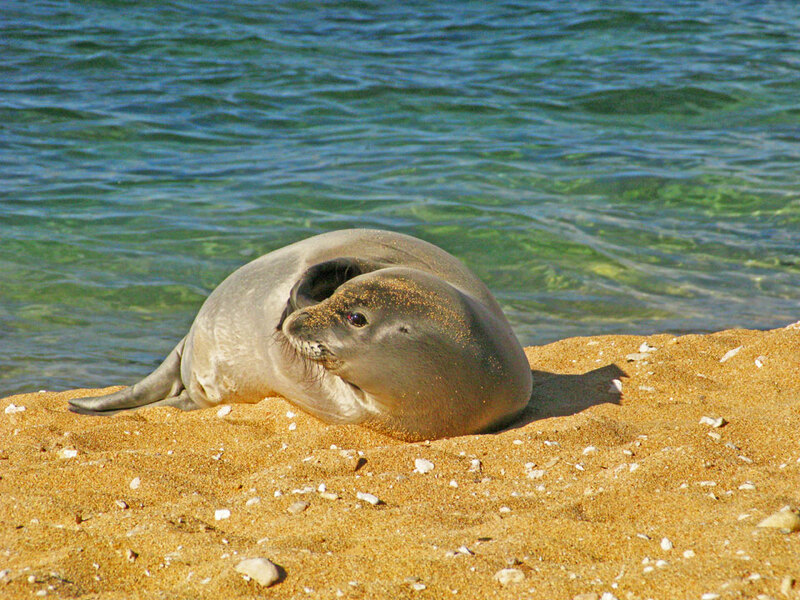 On February 8, RA20 gave birth to her second pup, boosting the Hawaii Island monk seal population to five resident seals. Reports are that mom and pup are doing well. DOCARE and state park officials have been super supportive and helping that island’s monk seal response coordinator, a member of Ke Kai Ola/The Marine Mammal Center. And, so, kicks off the 2018 pupping season. We’ve got more news on that front to come. Meanwhile, enjoy this unusual video submitted by one of our many loyal volunteers. It shows visible stomach movement of Kauai’s resident RK13. Could she be pregnant? First main Hawaiian Island pup for 2015! – Two females died from entangling in gillnets in the Bellows/Waimanalo area on Oahu. – RI37 has some large scars on her back – potentially from a propeller. Possibly because of the scars or other related internal injuries, she has had a history of miscarriages/abortions and stillborn pups. As of now, she has not yet had a live birth. 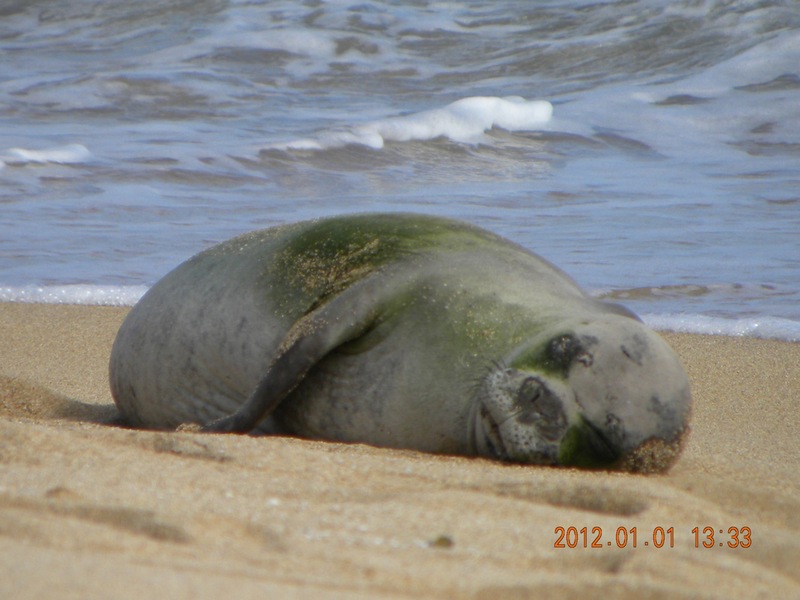 – First reports from kite surfers near Malaekahana State Recreation Area of a seal floating entangled/dead. – 14 November 2012 – Report of R5AY with hook in cheek on land. Covered in algae. Severely emaciated. 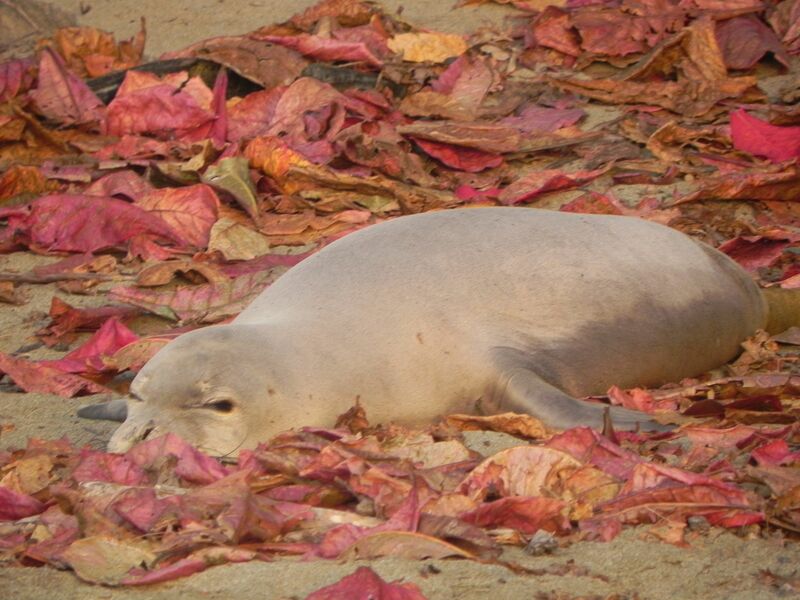 – 17 November – Captured at Sunset Beach by NMFS Pacific Islands Fisheries Science Center (PIFSC) staff. Brought to Waikiki Aquarium. – Recovery at Waikiki Aquarium. Progressed from eating dead fish to capturing live fish in pool. – 29 November – Released near Turtle Bay. Was fitted with satellite transmitter to track movements. – Continued surveys by volunteers after release to track location and body condition. – 12 December – Captured by PIFSC staff to give antibiotics, take blood sample, assess body condition. Appeared to be continuing recovery. – Mid-January 2013 – Satellite tag stopped transmitting or fell off. – Gestation length of monk seals is unknown. Period between pup birth dates is ~381 days (on average). After 6 weeks of nursing, females are usually seen ~19 days later with scratches & injuries that imply mating. So the assumption is that gestation is somewhere around 10-11 months. But other seals have delayed implantation – so who knows? We have had several reports of seals swimming up into canals on the east shore over the past few weeks. In particular, RK13 has been observed “logging” (resting at the surface of the water) in a canal near the Kapa’a Library. 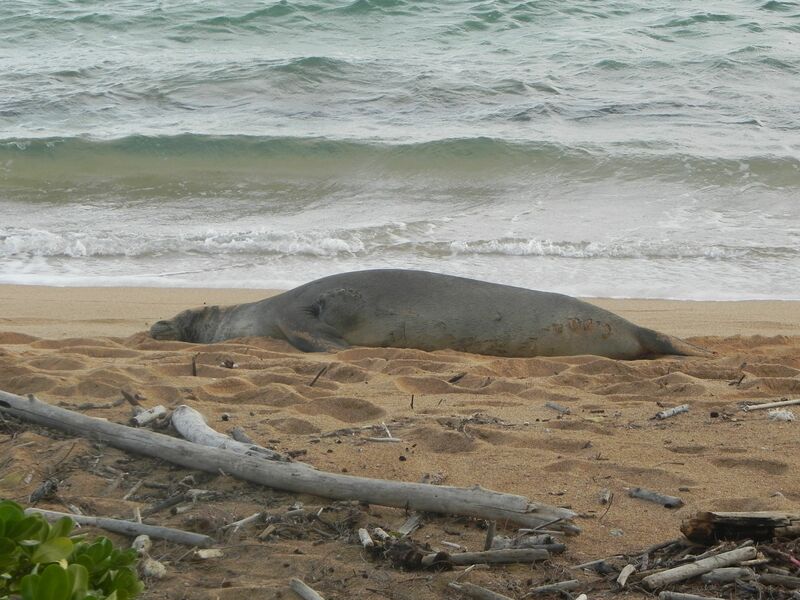 Both freshwater activity (and the health hazards presented therein) and logging are behaviors of concern for Hawaiian monk seals. Please be sure to report both immediately, so that our staff can respond and observe the behavior(s) in person. RK13 is of special concern, and we are monitoring her very closely. She has two new injuries (first observed 12/7), consistent with shark bites. One is near her left foreflipper, which she did not appear to be using for the first couple of weeks. The other is on the underside of her right side. Neither wound is life-threatening, they are not very deep, and both are showing quite a bit of healing progress. She began hauling out on sand again in Kapaa town on 12/11, but has also continued to visit canals. She rests peacefully in the Kapaa Library canal, but had a rough day in the canal near the Bull Shed restaurant on 12/13. The canal was a couple of feet deep when she entered it early in the day, but by afternoon it was down to a few inches of water. RK13 galumphed all the way up the canal behind the Safeway shopping center, and struggled to get out of the sludgy mud. It was awful to watch, but handling her would have been more stressful and likely less successful than letting her work her way through. She did figure it out, and worked her way slowly (lots of rest breaks!) back to the ocean. Since then, she has hauled out on sand in Kapaa, Anahola and Moloaa, and also spent a few more days in the Kapaa Library Canal. She is using her left foreflipper normally again, starting on Christmas Eve! Thanks for that holiday gift, RK13! RK30 (adult female, entanglement scar around neck and large scar on side), interestingly enough, was observed in two different Kapaa canals on 12/29. Careful not to get these two ladies confused! Another two seals who have flipped the switch on us are RK56 (weaner male, exhibiting curiosity toward humans in November) and RK52 (weaner female, born at Larsen’s, April 2011)! RK56 was most recently seen today at Nukoli’i on the east shore, and RK52 has been observed twice in Hanalei. Careful not to assume identity on these little seals – they’re on the move! RK52 has been hauling up very high and looking for trouble; last week she hauled out under a plastic chair, and the next day under a wire fence! Thankfully, she was not entangled. RB24 (subadult female who lost weight earlier this year) continues to look improved! Her body condition is back to normal. R313 (adult female, formerly Temp V23) received a new “V23” bleach mark while PIFSC’s Mark Sullivan was on island visiting. Thanks, Mark! R313 has been observed from Larsen’s to Ke’e. turned out to be a false alarm; the juvenile tagged seal was just investigating the lay-gillnet in the water. DoCARE reports that any net is illegal if it is either (1) left unattended, or (2) still set after sunset. This net was both, so law enforcement is working to identify the net and remove it. 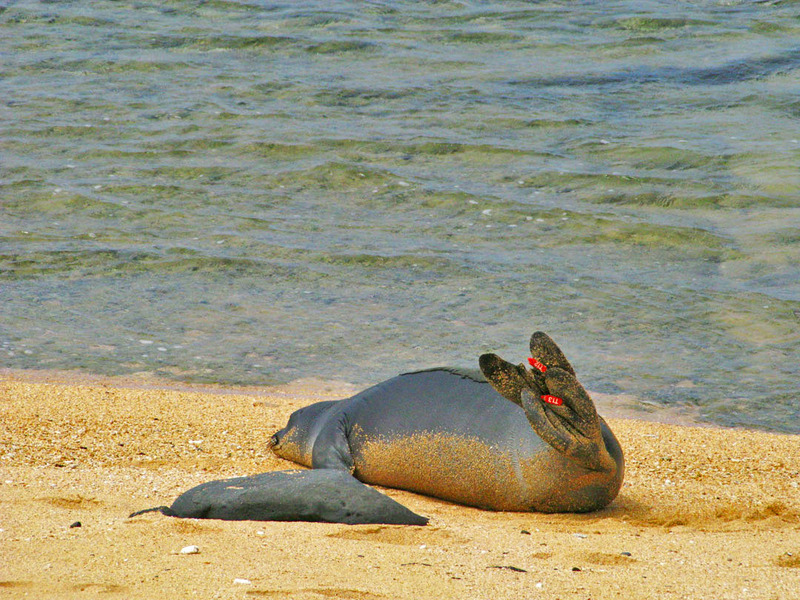 On 12/28, at sunset again, we had another report of a lay-gillnet set about 50 yards down the beach from a hauled-out seal, this time at Ke’e Beach. One of our volunteers was present and spoke with the fishers, but they left the net in place. Luckily, R313 (adult female bleached V23) did not get entangled. We saw her hauled out nearby the next day. RA20 (juvenile female born at Larsen’s in 2009, a.k.a. “Momona”, rarely seen) has been observed on the south and east shores recently! She is clearly not accustomed to being near humans; she is very sensitive, and was disturbed off of the Courtyard Marriott beach twice yesterday by beachgoers walking past her too closely.